This Metal Sheds one of Billyoh Metal Sheds . The BillyOh CARLTON Metal Shed range of apex roof style sheds is as attractive as it is functional. 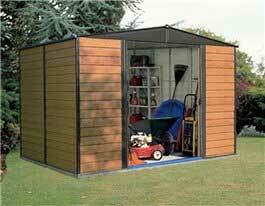 This metal shed maintenance-free and Long Lasting. Metal Shed pleasing woodgrain and shiplap style clad All unpainted steel framing is manufactured from quality hot-dipped galvanized steel . Billyoh Calton Shiplap Metal Shed . The Hotspot Urban 650 Fire Pit includes a spun steel firebowl, stainless steel safety ring around the perimeter (for those of you with children or pets) and hinged cooking grill. Urban firepits create the experience of a real fire feeling in the garden, providing atmospheric lighting and heat. It is constructed from spun steel providing a durable and long-lasting product. Ideal for those little jobs around the garden and much more! The Handy Garden Trolley can be used for transporting plants, tools, sacks of fertiliser, logs for the fire, garden waste and countless other items around the yard and garden. Measuring 4′ by 2′, this trolley has drop down sides for easy access and turnable steering. Pneumatic tyres ensure greater stability on uneven ground. Maximum load capacity 1000 lbs. Tow hitch provided for use with ride-on mowers. To improve manoeuvrability on hard surfaces your Billy Goat MV Multi Vac lawn vacuum can be fitted with this set of caster wheels at the front of the machine. With them you can turn on the spot and access confined spaces more easily. FREE DELIVERY 2-3 DAYS.